That’s our commitment to you and your pet. Bathurst Animal Hospital is a Toronto-based, full-service, pet health facility. We have served pets and their families from the same location in this neighbourhood since 1972. We are committed to providing high-quality, compassionate, veterinary care throughout the life of your pet. Our team and facilities provide preventive care for young, healthy pets; early detection and treatment of disease as your pet ages; and complete medical and surgical care as necessary throughout his or her lifetime. We love animals, we care deeply about their families and we offer our services in a supportive and caring environment. We make it easy and convenient to schedule appointments online! 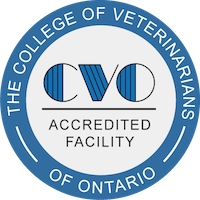 The Mission of Bathurst Animal Hospital is to provide the highest quality veterinary care for our patients and clients in accordance with the highest standards of the veterinary profession. We will do this by continuing to educate ourselves in ways to help our patients to live longer, healthier and happier lives. We shall treat our patients, clients and professional colleagues with the utmost respect and courtesy. We will share the joys of animal ownership with our clients and provide and sympathy and a positive environment in challenging times.